Rawalpindi - meherbabatravels jimdo page! The second lot travelled on the "SS Conte Verde", arriving in Bombay on the 14th December. 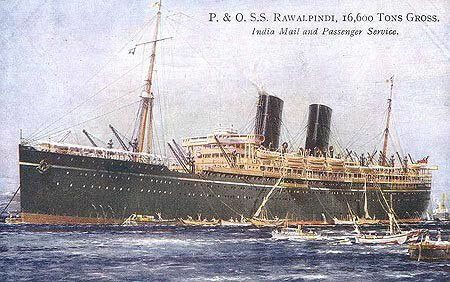 The third and final group travelled on the "PO Rawalpindi". They were ; Kitty, Margaret, Delia, Tom Sharpley, Will and Mary Backett. They arrived in Bombay on the 24th December. 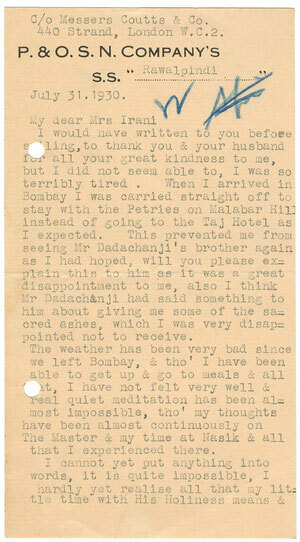 The next day they arrived in Nasik at noon. Sailing aboard the Rawalpindi, Kitty Davy, Margaret Craske, Delia DeLeon, Tom Sharpley, along with Will and Mary Backett arrived in Bombay from London at five-thirty in the evening on December 24th. They were met at the dock by about fifty Bombay lovers and after a night's rest were escorted to Nasik, reaching there at noon Christmas Day. 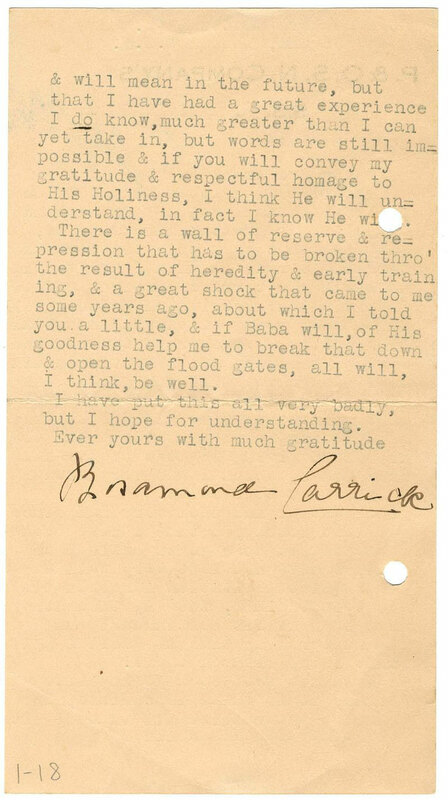 During the first week of June, 1937, Baba had decided to start sending certain persons back to Europe. Will and Mary Backett were sent to Bombay, and after a few days Kitty Davy, Delia DeLeon and Margaret Craske were also sent there. 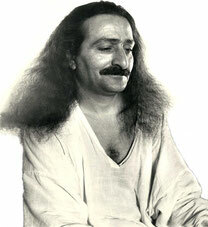 Baba joined them in Bombay on June 8th, and all stayed at Kaka Baria's residence. Baba took them to a movie one night in order to help them stop thinking of their upcoming separation. 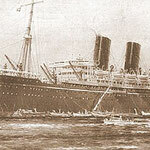 This group of five sailed for London on June 12th aboard the Rawalpindi, the same ship that had brought them to India six months before. 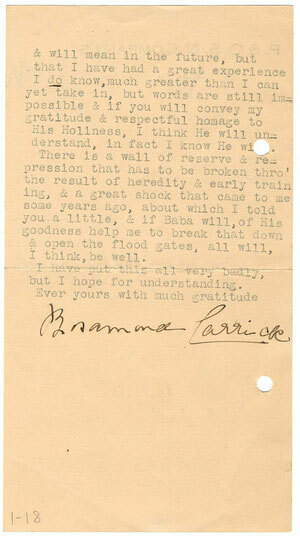 The next day, the group sent this message to Baba: "We depart under orders, but leave our hearts with you, Beloved." Although Baba had detailed plans for visiting Cannes, the lovers could never be certain whether or not this plan was a ruse, and dreaded receiving a telegram from India saying, "Plans changed," or "Postponed." This thought was uppermost in their minds as they departed. On June 26th, there was a Trust meeting at Meherabad. Norina and Elizabeth drove there from Nasik with Ramjoo and Kaka and returned the same evening. Baba directed Nadine Tolstoy to go to Venice, Italy, for the purpose of some work and she left on July 8th. Baba went to Bombay to see her off. With Nadine's departure, there were only eight Westerners remaining in Nasik: Jean and Malcolm Schloss, Norina Matchabelli, Elizabeth Patterson, Ruano Bogislav, Tom Sharpley, and Rano and Nonny Gayley. Thereafter, all the necessary preparations for travelling to Cannes began. 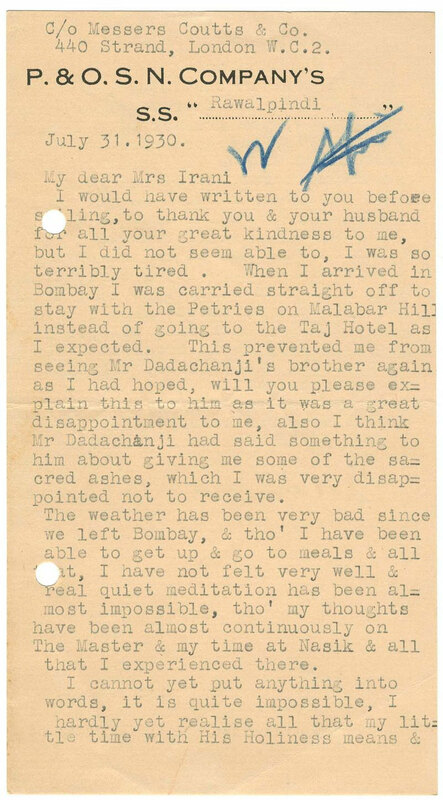 While sailing aboard the Rawalpindi, Kitty Davy, on behalf of the English group, wrote a farewell letter for publication in the Meher Gazette, summarizing their Nasik stay. She started life as the 16,695 registered tons P. & O. 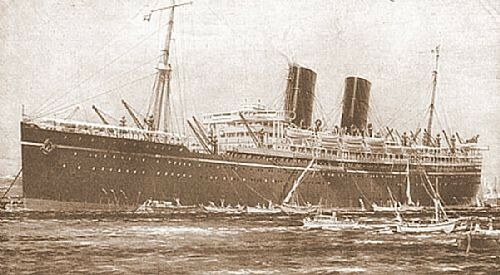 Steam Navigation Co. Ltd. ocean liner SS Rawalpindi out of London. 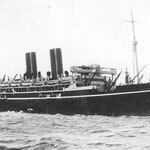 She was requisitioned by the Admiralty on 26 August 1939 and converted to an armed merchant cruiser by the addition of eight 6 in (150 mm) guns and two 3 in (76 mm) guns and set to work from October in the Northern Patrol covering the area around Iceland. While patrolling north of the Faroe Islands on 23 November 1939, she investigated a possible enemy sighting, only to find that she had encountered two of the most powerful German warships, the battlecruisers Scharnhorst and Gneisenau trying to break out through the GIUK gap into the Atlantic. Rawalpindi was able to signal the German ships' location back to base. Despite being hopelessly outgunned, 60-year old Captain Edward Coverley Kennedy RN of Rawalpindi decided to fight, rather than surrender as demanded by the Germans. He was heard to say "We’ll fight them both, they’ll sink us, and that will be that. Good-bye". 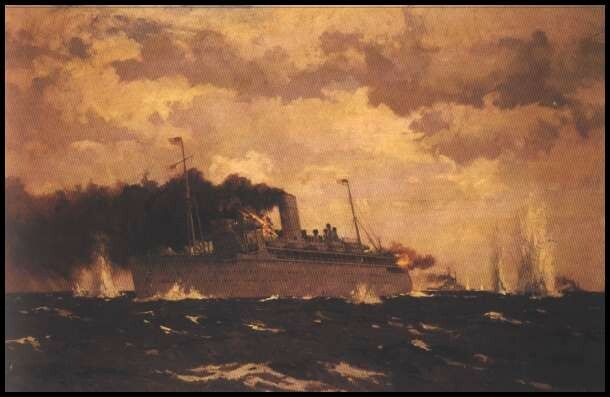 The German warships sank Rawalpindi within 40 minutes. 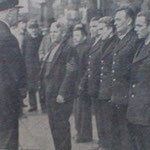 238 men died, including Captain Kennedy. 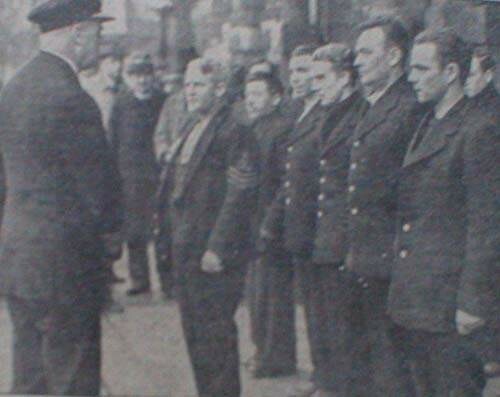 Thirty-seven men were rescued by the German ships, and a further 11 were picked up by HMS Chitral (another converted passenger ship). Captain Kennedy — the father of broadcaster and author Ludovic Kennedy — was posthumously Mentioned in Dispatches. Thanks to the actions of Rawalpindi, the German attempt to break out into the Atlantic was foiled. Scharnhorst and Gneisenau were forced to return to base in order to avoid interception by the British Home Fleet. Rawalpindi was one of the P&O 'R' class liners from 1925 that had the much of their interiors designed by Lord Inchcape's daughter Elsie Mackay. 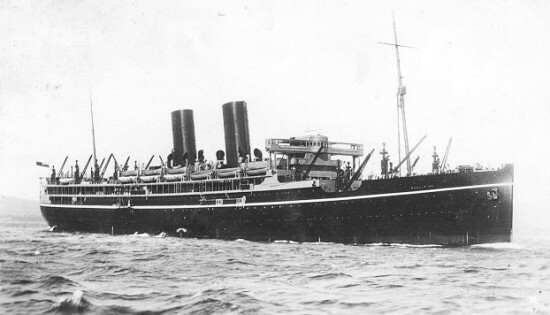 Her sister ships SS Ranchi, Ranpura and Rajputana were also converted to armed merchant cruisers. 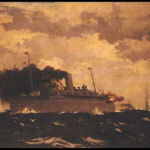 Rajputana was torpedoed by U-108 in the Denmark Strait and sunk on 13 April 1941.